Much like individuals grow and develop over time, so does a team. 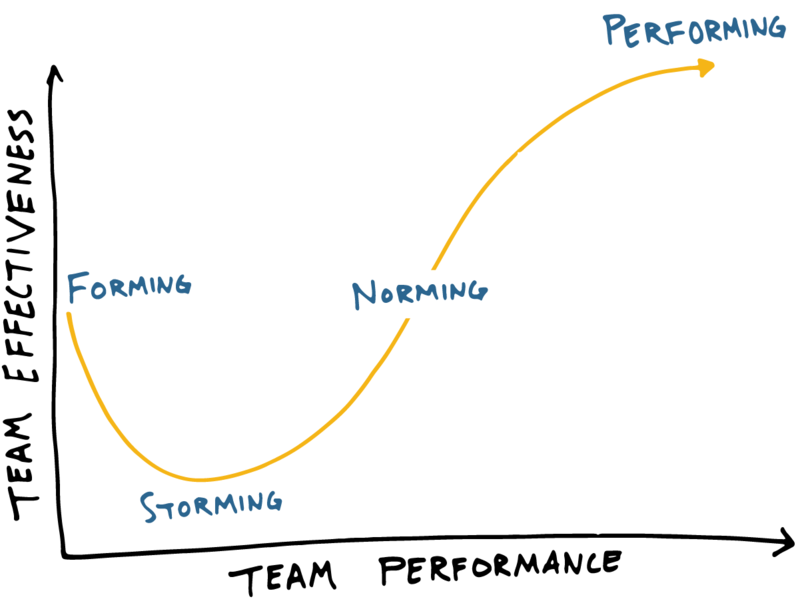 In a 1965 article in the Psychological Bulletin, Bruce Tuckman introduced a team and group development model that maps a team’s effectiveness as they progress through four stages: Forming, Storming, Norming, and Performing. Understanding this model allows you to shift your focus and activities over time to help your team advance from stage to stage. Here’s an overview of team dynamics at each step of the model, and how you can adjust your management style to fit the situation at hand. As people come together to form a team, energy and enthusiasm are generally high. Team members “play nice” with one another, but an aversion to conflict likely exists. One challenge of this phase can be information gathering, as the team strives to understand their objectives, roles, and responsibilities. As the leader, you should help the team understand the goals and how their role plays a part. Strive to create clarity, and be comfortable adopting a direct leadership style. As a team settles in over time, individuals begin to test the boundaries of the group. In doing so, a period of heightened intragroup conflict emerges, leading to a decline in effectiveness. This can be the result of different personalities, working styles, or lack of agreement and understanding of goals. When managed effectively, this conflict, however uncomfortable, helps establish how the team will work together going forward. Try to be readily available for the team at this stage. Team members might challenge your authority, or jostle for positions of greater influence. Play the role of coach and focus on facilitating trust between team members. Once teams can progress through healthy conflict, norms emerge that facilitate openness between group members and a shared set of standards and expectations. In this stage, the plan also solidifies as team members agree to timelines and the responsibilities of each team member. As trust develops, team members are more willing to embrace one another’s strengths and to ask for help. At this stage, you can shift into a facilitation role, helping the team make decisions and delegating greater portions of the work. But be mindful of suppressed conflict. Storming can still occur, so creating an environment where conflict is aired and resolved helps deepen trust. Following a shared set of standards and norms, teams can turn their attention to the tasks at hand through constructive action that allows creative solutions to flourish. Clear goals allow the team to perform with minimal supervision, and conflict becomes a productive tool to allow different perspectives to emerge. In short, the ground is set for a high-performing team. As the team’s leader, you want to foster healthy conflict and celebrate and reward the team’s achievements. In addition, you can further empower team members by stepping away and focusing their time on planning, gaining feedback from staff, delegating additional responsibilities, and potentially planning a transfer of leadership. As a team progresses through these stages, it’s normal to move up and down this spectrum. The addition of new team members, for instance, may challenge group norms and expectations. Similarly, if goals shift, the heightened uncertainty and stress can cause a high-performing team to slip into the Norming or Storming phases. I’ve found it helpful to share Tuckman’s model with my reports, so they can understand how the situations they’re facing are a natural part of our teams’s development. Hope this read helps you do the same.